UK MULTICULTURAL ENRICHMENT WATCH: MUSLIMS BEAT UP TRAINEE CHEF, THE 17 YEAR OLD COULD GO BLIND…….. – The Tundra Tabloids……. 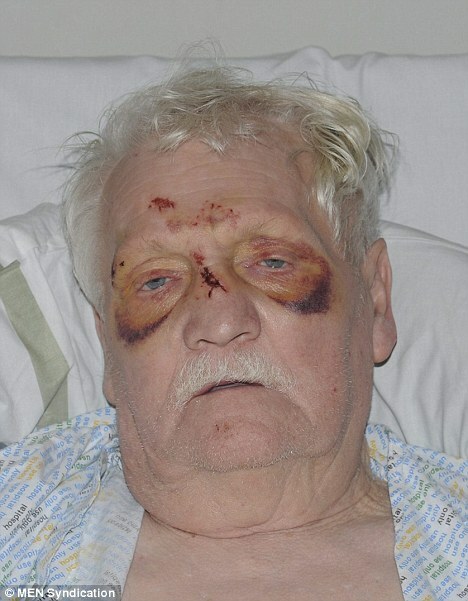 UK MULTICULTURAL ENRICHMENT WATCH: MUSLIMS BEAT UP TRAINEE CHEF, THE 17 YEAR OLD COULD GO BLIND……..
Just like they beat up this elderly WWII vet. NOTE: Facing multiculturalism at home was of more danger than facing enemies abroad. Dan Stringer, 17, who could lose his sight, was repeatedly kicked and punched by a mob of up to eight people after he fell over as they were chasing him down the street near Manchester. The teenager was left with a fractured skull, multiple eyesocket fractures and needs plastic surgery to mend the smashed bones in his face. The victim and his best friend Kavan Brown, also 17, were walking down Market Street, Hyde, Saturday evening when they passed by a takeaway shop. Previous Post Previous Post SHIRE NETWORK NEWS’ LAST PODCAST……..
Next Post Next Post UK JUDGE KICKS THE VOICE OF AL-QAIDA FREE…….. He suffered a fractured skull and two fractured eye sockets. Surgeons will need to rebuild his right cheek with a metal plate. He has now managed to open one eye. But he will have to wait until later this week to find out from experts if the damage to his right eye is permanent. His friend Kavan Brown, also 17, had his nose broken in the unprovoked attack in Nelson Street. 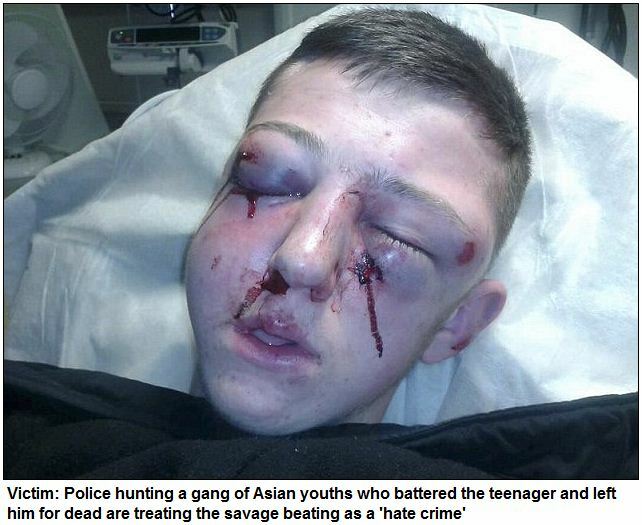 All the gang were Asian and the police are treating the attack as a race hate crime.. . . . As he recovered at home in Woodley, Stockport, Daniel told the M.E.N. of his terrifying ordeal. He described how he and Kavan were attacked on Saturday night as they walked along Market Street on their way to Asda. They planned to go home and watch a film. But as they passed a kebab shop a man inside banged on the window, produced a knife and made a throat-cutting gesture. The pals walked on, but a group of men came out of the takeaway and ran after them. A taxi driver who witnessed the attack pulled over and called an ambulance for the teenagers. England wake up ! Newspapers wake up and don’t lie , Asians ???? No way , those bastards are muslims , tell it like it is . Thats why we have to stand with the EDL . My God, he looks aweful! I hope he will recover from this very soon. They should kick out those who did it. Let it be a warning to other hatefilled ‘Asians’. I am absolutely disgusted with what these cowards have done. I also have a 17 year old son so I can totally empathise with this poor lads mother. I am also Asian and I have brought my son up with good values and to respect others. These thugs who have attacked this defenceless boy are nothing but low life’s and cowards and I would put lots of bleeps in if it would achieve anything. I hope they all get caught and get what they deserve. And I pray this lovely lad makes a full recovery and doesn’t let these low life’s win.